Rania A. Tahseen, Karam A. Amein, Dalia H. Samak, Yasser S. EL-Sayed, Sherif M. Nasr. 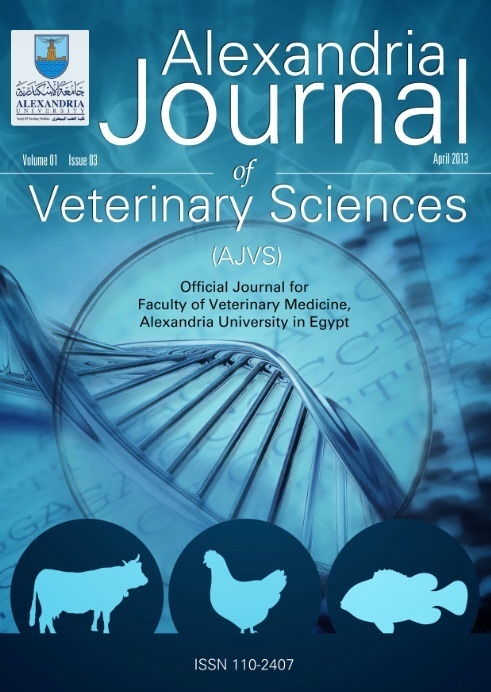 The study aimed to verify parentage and genetic variability among twelve Arabian horses using five ISSR markers. Forty-five DNA loci, which extracted for the sire, mare and foal were amplified and replicated using the tested primers with an average of 9.0 loci per primer, and every marker is compared. The total number of polymorphic alleles was 33 (73.33% polymorphism), with an average of 6.6 alleles per primer. The markers (GAG)6G-ISSR (12 loci), (AGC)6C-ISSR (11 loci) and (AGC)6G-ISSR (9 loci) amplified the highest number of loci and possessed the highest PIC values indicating that they are the most promising for analysis of genetic variety and paternity in the Arabian horse. The highest similarity and shortest genetic distance (Si=0.926, Gd=0.077) were between Abeer and her daughter Karma. While, the lowest similarity and longest genetic distance (Si=0.353, Gd=1.041) between Sary and Farhan. The UPGMA cluster analysis supported the genetic relatedness as expected among the 12 Arabian horses. The dendrogram grouped the 12 Arabian horses according to their paternity, i.e. pedigree levels, into three main clusters within a branched-off 0.439 genetic similarity.